If people taking our Port Orchard trivia quiz had trouble with the question on who was the longest-sitting public servant in city government, it’s understandable. The city’s had quite a few in recent years. 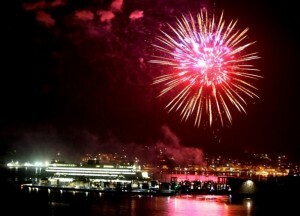 The trivia quiz, online now at www.kitsapsun.com, is part of our coverage of Port Orchard’s 125th anniversary. The city and community have a big celebration planned for Sept. 5. Check the Kitsap Sun on Sunday for a look back at Port Orchard’s history (it will help you on the trivia quiz) and a look forward at the celebration. 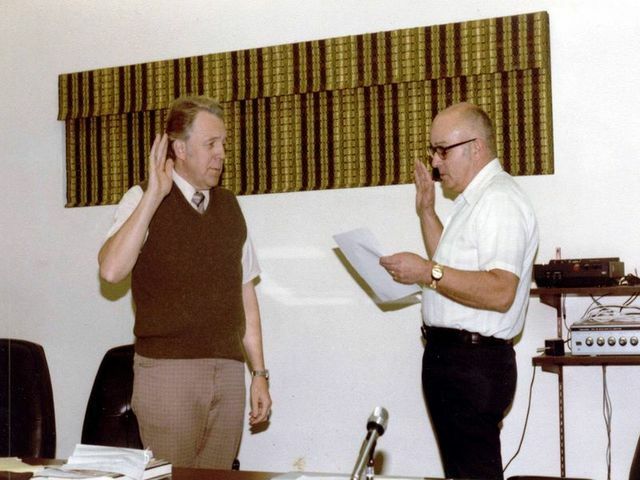 Q: Who was Port Orchard’s longest sitting public official? If you said, Bob Geiger, you’re correct. Geiger, who served 45 years on the city council, was not only Port Orchard’s longest serving public official but the State of Washington’s when, in December, 2007, the mayor and council honored him for his service. Geiger had announced he would not seek another term. Carolyn Powers, was appointed to the city council in 1987 to fill an unexpired term and served 26 years on the council before retiring at the end of 2013. She also served a term in the State House of Representatives. Leslie J. Weatherill was Port Orchard’s longest serving mayor, holding the office from December 1983 through December 2003. John Clauson, running for re-election this year, has served on the council since 1983, 32 years. Were you one of the people at Fred Meyer Monday evening as South Kitsap firefighters and paramedics randomly paid customers’ tabs at the checkout counters? Here are excerpts of the story about their generosity that will run in tomorrow’s paper. When you’re done reading, I hope you’ll comment on random acts of kindness and generosity you’ve witnessed (or received) this holiday season. SOUTH KITSAP — Shoppers at Port Orchard’s Fred Meyer were surprised Monday to see South Kitsap Fire & Rescue firefighters hanging around the checkout stands, randomly stepping up to pay for people’s groceries. This is the third year in a row the South Kitsap Professional Firefighters, a union of firefighters and paramedics, has organized spontaneous acts of kindness in the three days before Christmas, according to Battalion Chief Jeff Faucett. South Kitsap Fire & Rescue doesn’t actively take part but condones the event by allowing on duty firefighters to participate in the gifting — as long as there’s not a fire or other emergency. This year’s effort was spearheaded by Firefighter Eddie Lange of Station 31, Faucett said. The union allocates money for each shift of firefighters and paramedics, and each shift decides how to dispense the boon, which they wield in the form of prepaid Visa cards. In a previous year, one shift hosted Shop-with-a Firefighter, for example. Faucett added he’s heard of other fire departments doing similar forms of drive-by gifting. Chiefs are in a different union, but Faucett, when he was still part of the professional firefighters group, had a hand in the generosity, paying it forward for customers at a local Albertson’s store. He still remembers the reactions he got. Merry Christmas from all of us at the Kitsap Sun! The city of Port Orchard will put a notice in upcoming utility bills reminding folks to be safe and sensible about fireworks. The decision was triggered by recent complaints from city residents. Among them is Elissa Whittleton, who is weary of the traffic and — as she describes it — mayhem that take place on the 4th of July in her Tracy Avenue neighborhood. It should be noted that Tracy Avenue, perched up on the hillside above Sinclair Inlet, has one of the best views in the city of the annual Fathoms ‘O Fun fireworks display. The city council on March 18 brought in Port Orchard Police Chief Geoffrey Marti and South Kitsap Fire & Rescue Chief Steve Wright to talk about what could be done to maximize safety. Wright recalled past efforts to impose a countywide ban on fireworks that fizzled out for lack of support. Staffing for Independence Day is always a challenge, both chiefs said. Both the fire and police departments call in additional help, but officers and fire units can’t be everywhere. SKFR factors in weather conditions in planning for the 4th. 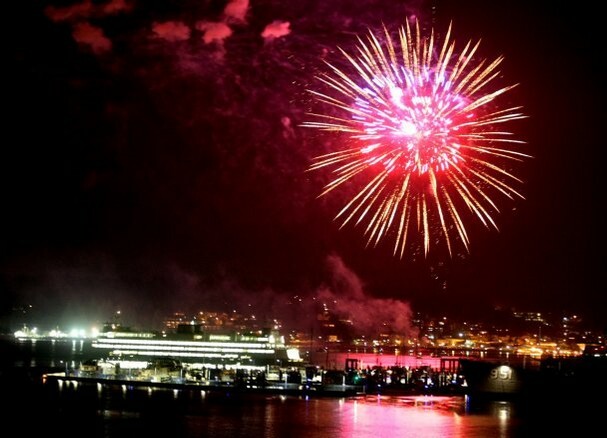 Mayor Tim Matthes noted that two years ago the fireworks were “pretty bad,” but last year, the Port of Bremerton prohibited fireworks on its property and had volunteers (identified as representing the port) patrol the property. Warning signs also reminded waterfront visitors. The result was a calmer atmosphere, Matthes said. He recommended the city recruit additional volunteers to help the port’s effort. Bek Ashby, a council member who lives in the same general area as Whittleton, said she enjoys the festivities and is resigned to the drill. Months later, she still finds spent incendiary devices in her flower beds. Whittleton, at the council’s March 25 meeting, thanked them for discussing the idea but said, “not much headway” was made in resolving safety issues. She suggested charging a tax or fee on fireworks sold in the city and using the money to enforce the prohibition against illegal fireworks. What are your thoughts on fireworks? Love ’em? Hate ’em? Tolerate ’em? What suggestions do you have regarding celebration of Independence Day where you live? 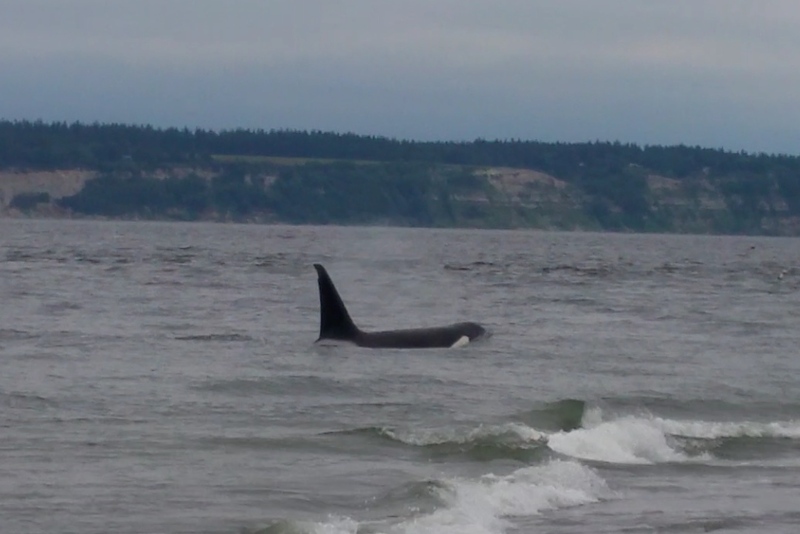 And finally, what’s the best place in Kitsap County for watching fireworks? Bake sales are all well and good, but here in Kitsapland (and it’s safe to say the Northwest in general), we like to get double duty out of raising money for a worthy cause. Upcoming are two events where you can get vigorous exercise in the fresh air while doing good. The first is the Jingle Bell Run, raising funds to combat juvenile arthritis, on Saturday in Port Orchard; the second on Dec. 14, is NewLife Kitsap’s Walk for Water, raising money to build wells in Africa, to be held on waterfronts in Port Orchard, Gig Harbor, Silverdale, Bainbridge Island and the Theler Wetlands in Belfair. Both require registration, and pre-registering is preferred. But you can jump on board with both events the morning of. Both events raise awareness of of things most of us (I think it’s safe to say) take for granted. When it’s raining buckets here in the Northwest, like on July 4th, most of us probably don’t think, “Dang, I wish we had some more water around here.” Kitsap, which relies solely on rainfall to replenish its reservoirs and aquifers each year, has faced seasons where water conservation is encouraged. But we’re always able to turn on the tap for a drink of potable water or a bottle of water at the convenience store. In contrast, many people in sub-Saharan Africa lack access to clean water. The average African walks 5 miles a day for water, according to people at New Life who are organizing the Walk for Water. The journey is dangerous and most of the water gathered is unclean, causing illness and sometimes death, especially among young children. Walk in the Light, a charity supported by NewLife in the Walk for Water, collects money to build wells and bring other forms of water purification to towns in Burkina Faso. Last year, reporter Josh Farley wrote about the organization, founded by Tom and Katy Cornell, who are also involved with NewLife. The couple, while attending Northwestern University in Kirkland, got to know a man from Burkina Faso, and so learned about the needs of people there. 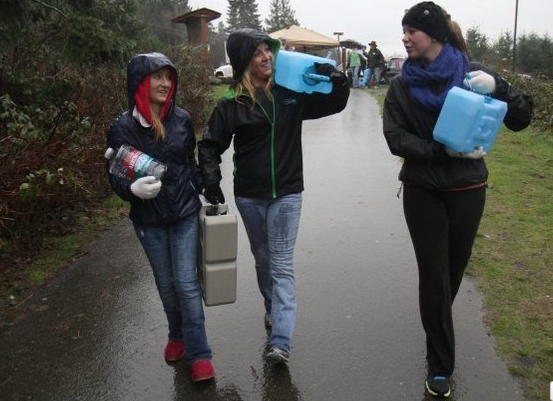 In 2012, 80 people took part in the first Walk for Water in Kitsap County, treking 2 1/2 miles along the Silverdale waterfront with empty five-gallon jugs and other containers. They filled them and lugged them back, getting a taste of what people (most women and children) must do each day. Lack of a clean water source is not only inconvenient and unhealthy, it robs people of the time to work, get an education and have a life, as the saying goes here in the U.S. The event has been expanded this year to several waterfront locations. When: December 14; registration a 9:30 a.m.; walk starts at 10 a.m.
Where: Gig Harbor waterfront; Bainbridge waterfront Park; Silverdale waterfront; Port Orchard Westbay Center; Theler Community Center. What: The length of the walk is 5 miles. Each person will be given a 5-gallon container to carry on the walk or bring your own. Cost: $20 registration fee to receive a T-shirt and five-gallon container (fee waived if you skip the T-shirt and bring your own container); recommended donation of $100 to walk. Online registration through Dec. 12. I ran into Sheila Cline the other day at MoonDogs (when I was covering that outrageous tip the restaurant received). Cline was busy preparing for the third annual Jingle Bell Run, an event she has captained since 2011, in support of her daughter Kinsey, who has juvenile arthritis. The 5K run/walk is part ofPort Orchard’s Festival of Chimes & Lights. The Jingle Bell run is the signature event of the Arthritis Foundation. To get the organization on board with allowing the run in Port Orchard, Cline had to guarantee a minimum level of participation. No worries there; the run has exceeded expectations each year, involving more than 1,000 runners (some real serious types) and raising more than $50,000 annually for the organization. Kinsey Cline has struggled with arthritis since she was 8. Now 13, she’s having a good year and able to regularly attend John Sedgwick Junior High School. That wasn’t always so. Last year, she missed a lot of school and experienced a lot of discomfort. Now on a new medication regime, Kinsey’s arthritis is well controlled. As those with the disease know, it’s an ongoing battle to stay mobile. Something those participating in this year’s run/walk might consider as they trot (or clip) along Bay Street and Beach Drive. Kinsey was the honoree at the first Jingle Bell Run. This year’s honoree is Linda Banks of Port Orchard who was diagnosed with rheumatoid arthritis two years ago. Now 48, Banks was and is an athlete, and she finds that exercising and staying active helps reduce her arthritis symptoms. A member of the Kitsap Tri-Babes, Banks has participated in many triathlons, and on her birthday in 2012, Banks completed an Ironman triathlon in Cour d’Alene, swimming in the choppy 58 degree lake, bicycling, and then running. Doctor’s have advised against her running for the time being, but Banks will participate by walking the 5K on Saturday. A costume contest is at 12:30 p.m.; kids’ 1K at 1 p.m.,; 5K at 1:30 p.m. When: Dec. 7, 11 a.m. – 5 p.m.